DxO OpticsPro 10 supports your camera’s JPEG or RAW files, as well as DNG files produced by Adobe conversion programs, so as to process them with the highest possible quality. A default preset is a collection of corrections that are automatically applied as soon as the image is opened in the program. To these are added the DxO Optics Modules corrections that are specific to the camera/lens combination used to shoot the photo. 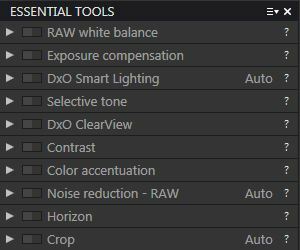 Of course, DxO OpticsPro 10 also lets you correct your photos manually by using the many tools available in the the Customize tab. Afterwards, all you need to do is export your images to your hard drive, to other programs, to your Flickr gallery, and/or to Facebook. You can also print your photos and create contact sheets. This tutorial will show you a workflow that will help you quickly master image processing with DxO OpticsPro 10. Preface: JPEG or RAW: which format should you choose? To get the best out of your images and from DxO OpticsPro, we recommend that you use RAW format when shooting. This will give you much more latitude when making your corrections, notably where tone (i.e., luminosity and contrast) is concerned. Further, DxO OpticsPro never modifies RAW files, thus ensuring that all corrections can be reversed and that the original file will be preserved. However, the JPEG files from your camera must be considered as “final images,” since they have already been corrected and processed by the camera. Although some corrections a posteriori are possible, they are much more limited. In this section, we will look at DxO OpticsPro 10 from the angle of someone using it for the first time after installing it. This approach will take us through some of the basic operations, the interface, and the ergonomics of the software. The Organize tab, which lets you browse the contents of your hard drive and your image folders and files. The Customize tab, which contains all of the image correction tools, and which we will discuss in the second part of this tutorial. The DxO OpticsPro 10 interface is customizable. You can create your own workspaces in either edition, and you can create your own tool palettes (Elite edition only). To browse the contents of your hard drive, go into the Organize tab. This tab is composed of a Source Browser to the left, a Viewer for displaying an image, and on the bottom, a File Browser that displays the contents of a selected folder. Located on the left side, the Source Browser displays a hierarchical list of the contents of your computer’s hard drive. It works in the same way as Windows Explorer on your PC or the Finder on your Mac. Find and select the folder with the images you want to correct in DxO OpticsPro. The very moment you select a folder of images and open it in the File Browser is when DxO OpticsPro automatically corrects the image using the default preset and the DxO Optics Module(s) corresponding to your equipment. Located along the bottom of the DxO OpticsPro window, the File Browser displays thumbnails of the contents of the folder selected in the Source Browser. To display an image in the Viewer, just click on its thumbnail. You can go from one image to the next by clicking on them successively, or by using the arrows keys on your keyboard. By default, the thumbnails will only display the name of the image file and its star ranking (if any). However, they can also display a certain number of other kinds of information about the image in terms of processing and its corrections (i.e., availability of a DxO Optics Module, processing status, the processing indicator, etc.). 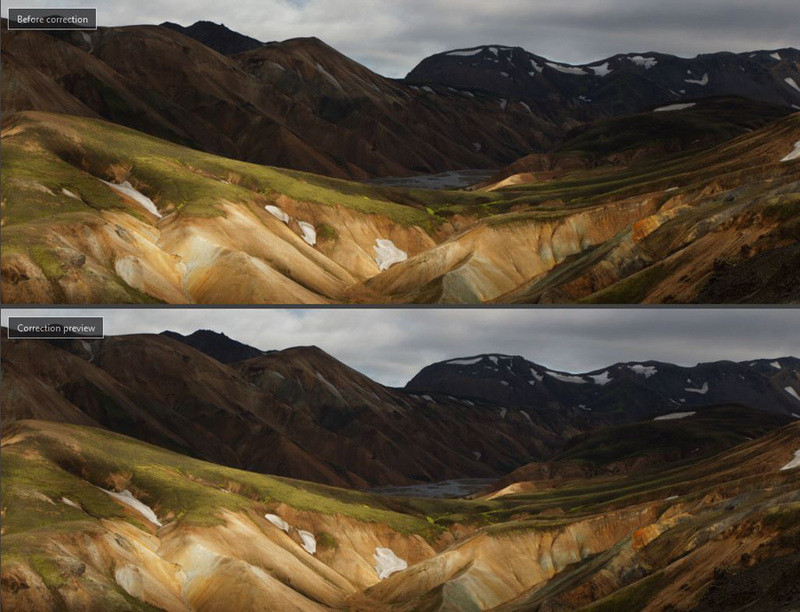 One of the two pillars of image correction in DxO OpticsPro is its use of DxO Optics Modules. In fact, DxO Labs analyzes in its laboratories, each camera/lens combination in order to provide a high-quality and automatic correction of all optical flaws. The DxO Optics Modules library offers thousands of camera/lens combinations, with many more added on a regular basis. You don’t need to do anything about installing and using DxO Optics Modules. As soon as you open images in the File Browser, DxO OpticsPro will automatically take into account the information about the camera and lens stored in the EXIF metadata of the images and open a window displaying the corresponding DxO Optics Module(s) to be downloaded. This automatic installation does not require restarting the program. 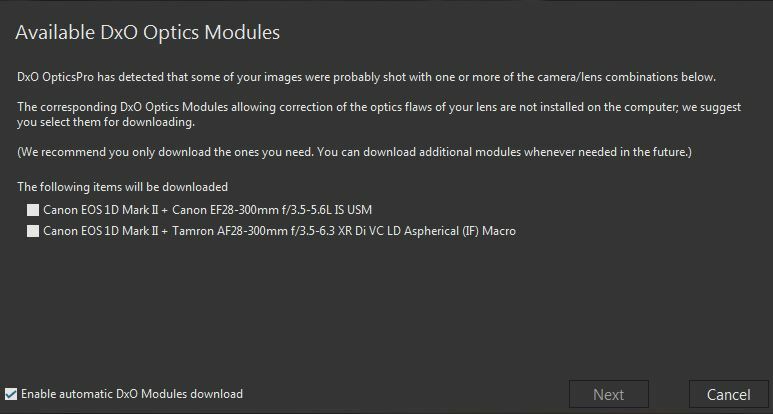 The DxO Optics Module download/installation window. Lens softness: Optimization and homogenization of sharpness from the center of an image outward to the edges (lenses generally being sharper in the center of the image). DxO Optics Modules automatically correct lens defects. The other pillar of DxO OpticsPro’s automatic corrections is its DxO Standard default preset, which acts on tone, colors, and noise. DxO OpticsPro offers you a choice of creative presets that you can select by clicking on the Presets button in the upper right of the program. 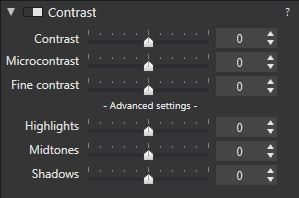 You can also create your own presets from your current settings. As soon as you select a folder containing new images, those images will be displayed in the File Browser and the corrections of the DxO Standard default preset will be automatically associated with them. White Balance is set by default to Original — that is, it adopts the camera’s setting. DxO Smart Lighting, which automatically optimizes the balance among the different color ranges of the image, is set on Slight. Color rendering applies your camera’s original rendering. Protection of saturated colors, which protects vivid colors from being over-saturated, is set on Auto. 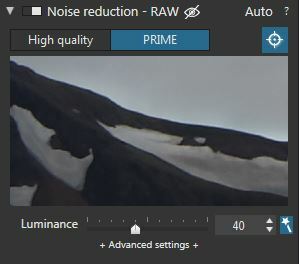 Noise reduction, which depending on your camera and ISO, optimally attenuates the luminance noise (graininess) and chrominance noise (colored pixels); it is set on Auto in High Quality mode. 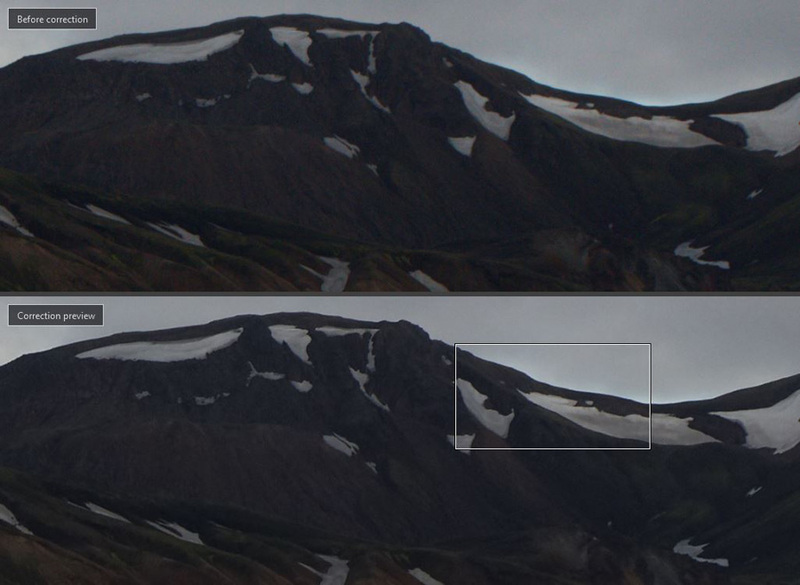 Click on the Compare button in the upper command bar for a side-by-side look at your image after/before correction. Generally speaking, an image is made for being displayed, published, or printed, so DxO OpticsPro gives you all of the necessary tools to export your images to your hard drive, to another image-processing program, to a Flickr gallery, to Facebook, and (of course) to a printer. 1 – Select the image or images that you want to export in the File Browser. 2 – In the bottom left corner of the program window, click on the Export to disk button. 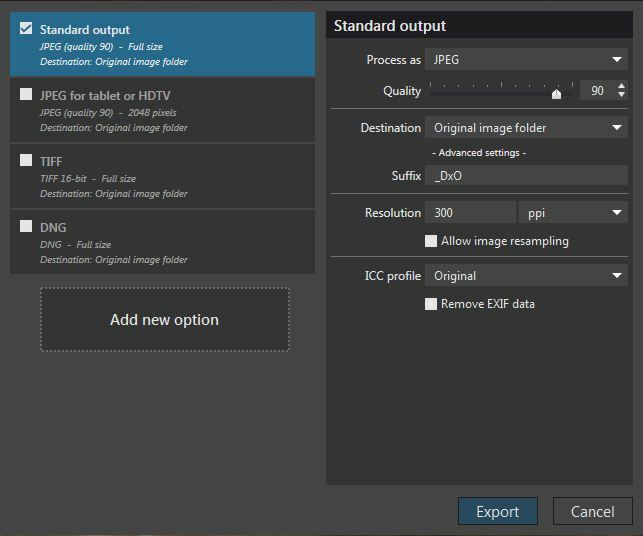 3 – In the floating window that appears, the Standard output is activated with the following default settings: JPEG format, quality 90, folder of original image as the destination, etc. 4 – Click on Export. 5 – The export underway is indicated by a pictogram that displays to the left of the blue button, in the upper bar of the File Browser. 6 –When the export is finished, the JPEG file will appear in File Browser, ready to be published to your Web gallery, sent by email, or printed. In this section, we are going to go beyond the automatic corrections applied to images to focus on the correction tools in greater detail, particularly those found in the Essential Tools palette. Technically speaking, the order of corrections is not important: the final result will be the same. Nevertheless, for a coherent workflow, we recommend that you adopt the order followed in this tutorial. 1 – Click on the eyedropper in the sub-palette or in the upper toolbar. 2 – Move the mouse pointer (which will become an eyedropper) to a neutral area (white or gray) and click on it. 3 – Validate by clicking on Close on the bottom right, under the Viewer. 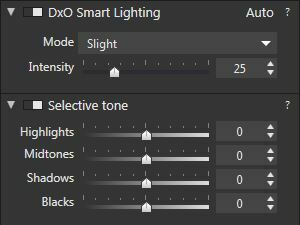 DxO Smart Lighting: Optimizes the dynamic range by using adapted presets in the Mode menu (Slight, Medium, Strong, Custom, DxO OpticsPro 9, DxO OpticsPro 7), or manually using the Intensity slider. Selective tone: Lets you adjust each of the different tonal ranges in the image by using the Hightlights, Midtones, Shadows, and Blacks sliders. The DxO Smart Lighting and Selective tone sub-palettes. DxO ClearView lets you automatically or manually correct the atmospheric haze that tends to drown out details and diminish colors, notably in landscape and urban landscape photos. To apply DxO ClearView, all you need to do is activate the sub-palette. The default setting is 50, from which point the strength of the correction can be increased or decreased. 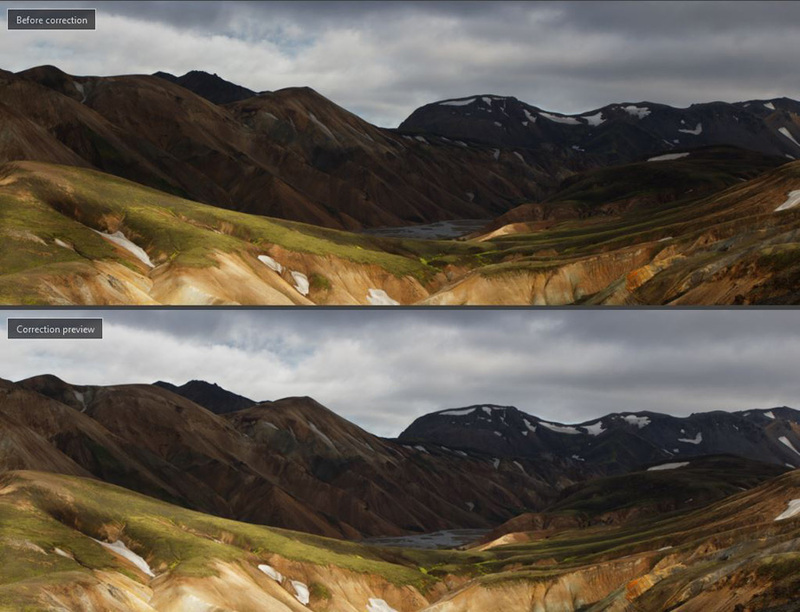 Contrast: Lets you adjust the gap between the brighter and darker parts of the image. Microcontrast: Reinforces the presence of the micro-details and textures in the image. Conversely, if you set the slider on a negative value, the micro-details will become more diffuse, which can be helpful for giving a softer rendering to portraits. Microcontrast boosts the details in an image. 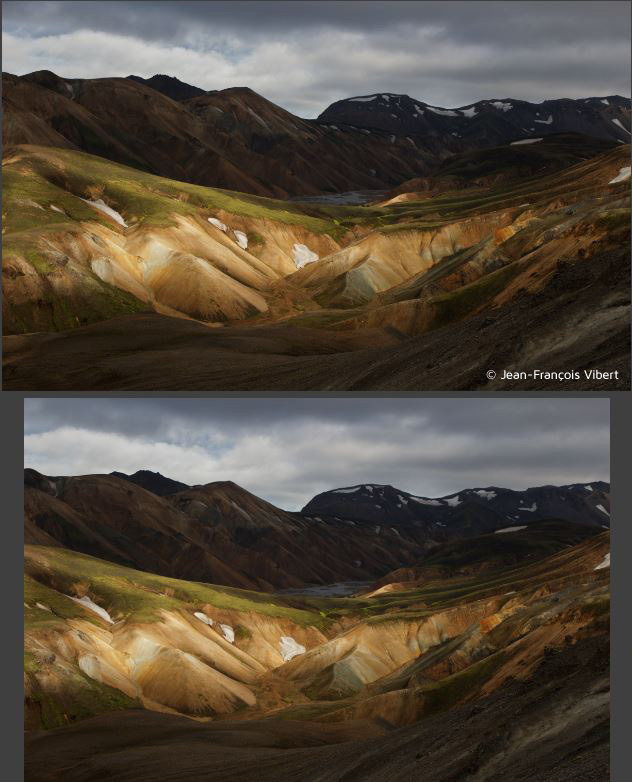 Vibrancy: This slider can be used to accentuate the blue of the sky without affecting the other colors in the image. 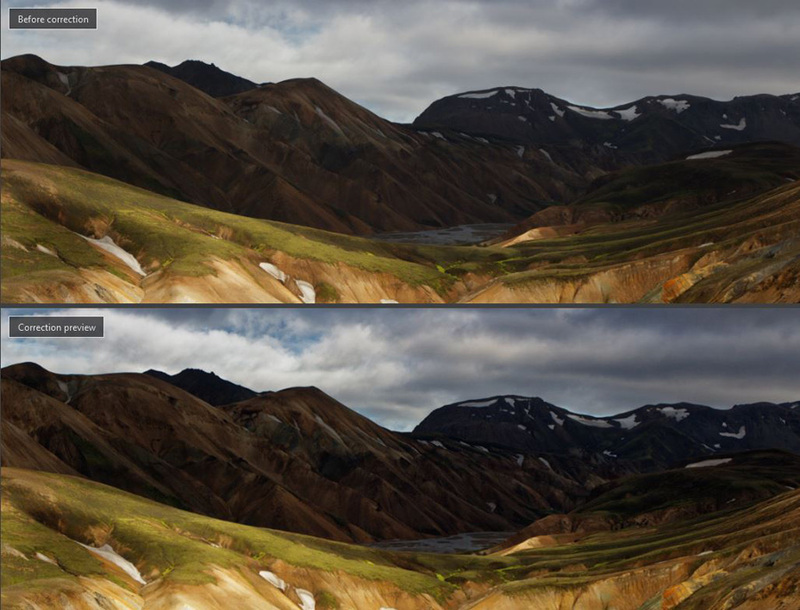 Saturation: This slider increases or decreases the saturation of all the colors in the image. 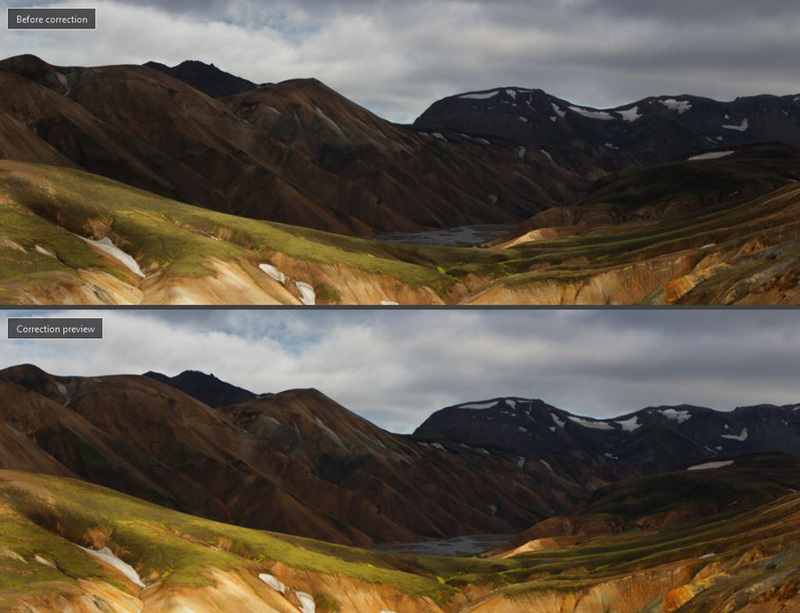 Effects of the Vibrancy slider, before and after. Digital noise affects images more and more as the ISO increases in sensitivity. It can be seen as graininess (luminance noise) and as masses of colored pixels (chrominance noise), particularly in the darker parts of the image. High Quality: Applied as soon as an image is opened in DxO OpticsPro 10, this mode is suitable for most images, or when it’s necessary to work quickly. DxO PRIME (Elite edition): Even more efficient in reducing noise, this mode lets you preserve the integrality of the details and the fidelity of the colors in your images. It works particularly well with images taken at very high or extreme ISO values. Application DxO PRIME denoising technology. Processing time is up to 4x faster. The denoising preview window is 2x larger. Horizon: Lets you straighten the horizon or make plumb a vertical element. Crop: Lets you trim your image and change its frame. You can keep the original aspect ratio or use a different ratio. A straightened and cropped image. We’ve just taken a look at the corrections that photographers are most likely to use, either to take advantage of the corrections automatically applied by the DxO Standard and any associated DxO Optics Modules, or to adjust those corrections in part or entirely. Export to disk: Lets you export an image or a batch of images (JPEG, TIFF, linear DNG formats) to a disk volume or folder of your choice. 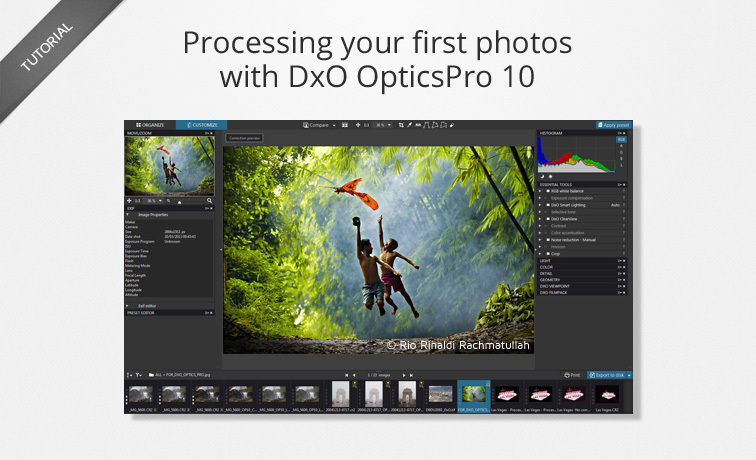 The Elite edition of DxO OpticsPro 10 lets you perform more than one type of exportation to different destinations and in multiple formats simultaneously. Export to application: Lets you export your images into other programs such as Photoshop, to make complementary corrections or for retouching. Export to Facebook: Lets you publish your photos in Facebook (albums and status updates). Export to Flickr: Lets you publish your photos to your Flickr gallery. 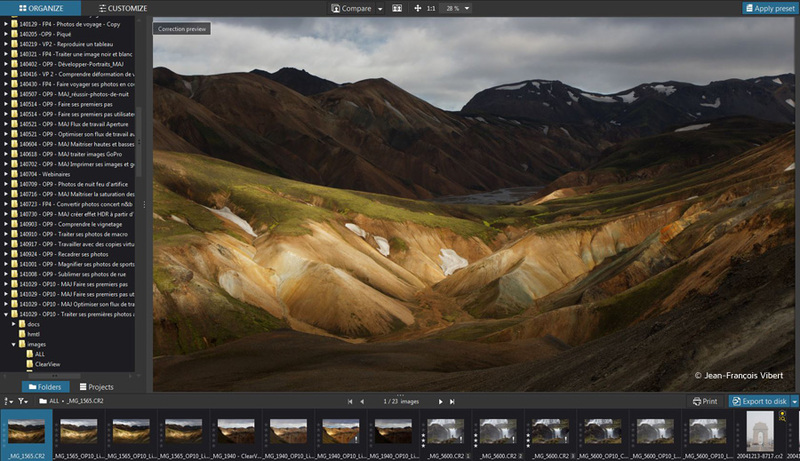 Export to Lightroom: Lets you export your images into the Adobe software workflow. 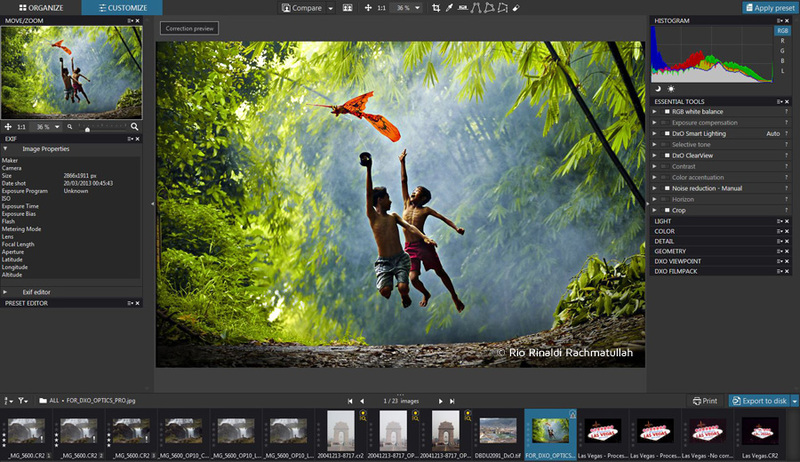 DxO OpticsPro 10 also offers a plugin version that offers the integration of a RAW workflow based on Lightroom. You can find out more about this workflow in our dedicated tutorial. Print: Lets you print individual or a series of images, and create contact sheets. To go even further in discovering how to use DxO OpticsPro 10, go to the DxO Academy page, where you will find many tutorials, the user guide, recorded webinars, and video presentations.